- Electricity Boards: Generation, Distribution etc. Aluminium barrelare chemically treated to reduce contact resistance and corrosion and are filled electrically condctive corrosion inhabitant with a jointing compound and capped. 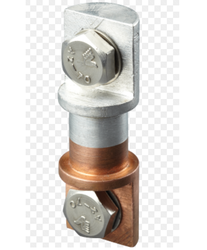 Bi-Metallic Connectors are made from the Highest Quality Electrolytic Grade Copper & Aluminium which are joined using a friction welding process. Aluminum barrel are chemically treated to reduce contact resistance and corrosion and are filled electrically conductive corrosion inhabitant with a jointing compound and capped. Application : splices are used for joining aluminium cable to copper cable. Al-Cu Bi-Metal splice are used for joining Aluminum Cable to Copper Cable. We are among the industry veterans, presenting Reverse Bi MetallicConnector Pins for our customers. The offered lugs are dimensionally accurate and are manufactured using premium quality materials.